Hummus is a popular middle east dip or spread known world wide. This hummus is colourful, creamy, smoky, spicy, slightly sweet and with the garlicky goodness. Hummus an old favorite with a flavorful “twist”. Goes great with grilled pita bread, pita chips, crackers and with any types of vegetables or with cooked meat. 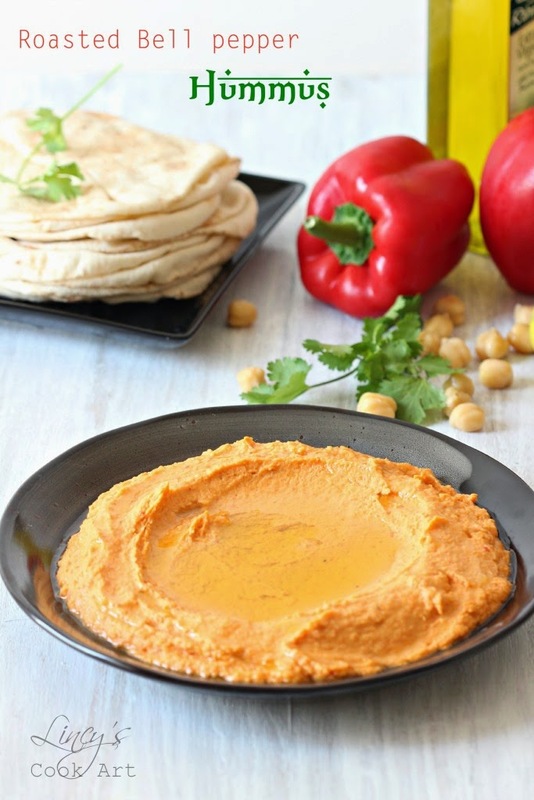 Healthy tasty hummus perfect as a spread in making pita bread rolls with meat or vegetables. Rich in protein and the goodness from the capsicum makes the spread so healthy and light. In my home we are all a big fan of hummus and we enjoyed the hummus with a twist a lot. Click here to get traditional hummus recipe. Soak the dry channa for 5-6 hours or overnight and pressure cook them with little salt for 3 whistles till soft. Wash the bell peppers and wipe them; Roast them on low flame on stove top by turning often to cook them evenly till blisters form all over the bell pepper. Wrap the cooked bell pepper on a kitchen towel to retain the heat inside for 5-10 minutes. The heat inside the bell pepper which makes the bell pepper to sweat and separate the skin from the flesh. Open the parcel and peel the skin as much you can and cut open and discard the seeds and chop the bell pepper. (or) Cut the bell pepper and remove the seeds and cut them into big pieces and bake the bell pepper by keeping skin side up and bake it on a preheated 180 degrees oven for 5 minutes or till the top of the bell pepper gets black blisters. Cool them and peel them. In a blender jar add the cooked chickpeas, cut bell pepper, cut garlic cloves, chilli powder, tahini paste, lemon juice, salt and start to grind as a paste. While grinding stop in between and scrape the sides, and the olive oil little by little and grind till you get a smooth paste. Chill the hummus till u serve. Hummus will firm up slightly as it chills. While serving make a small depression on the middle and drizzle olive oil all over to cover the hummus to prevent drying out. Hummous looks so tempting..looks lovely.